Antiques dealer and decorator Florence Lopez runs her business directly from her apartment, a former sculpture studio on the Rue du Dragon, maybe because she has not a usual white-box gallery atmosphere here. 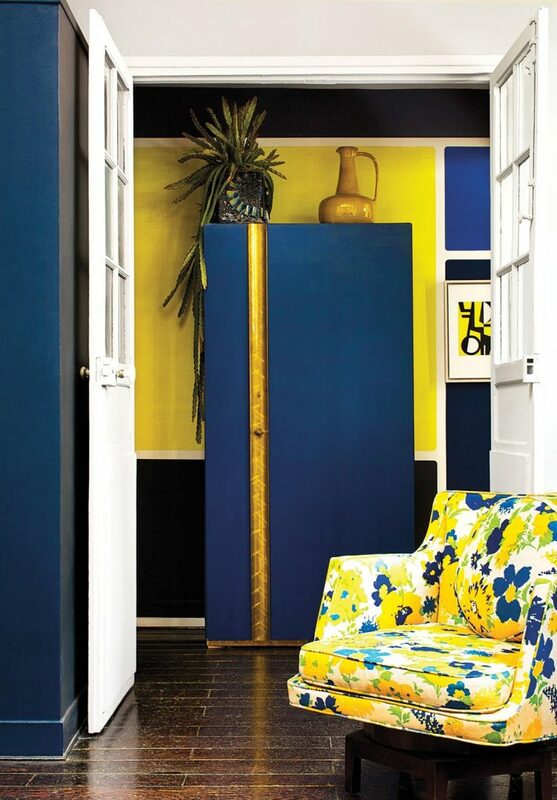 Her extraordinary eye for color and form is fully reflected in the apartment décor. The free-spirited approach Lopez takes to the living space demonstrates her talent for composing a total sensory experience, one that spotlights the idiosyncratic furniture and objects she finds while traveling or negotiates through a network of suppliers. Though she has a bias toward modernism, her taste is unbound by the centuries. She also favors sensual pieces, often tinged with a whimsy that seems to emanate from the personality of the creator. To my mind, every room here looks like some unique painting in the mix of mid-century modern, cubism, modernism and primitivism. The interiors are done in dazzling blue, emerald and even graphite black contrasting with white, yellow and orange touches. Each space has its own character and mood. Antique dark floors with a shabby look are used throughout the whole apartment, and they give it that unique and refined look. 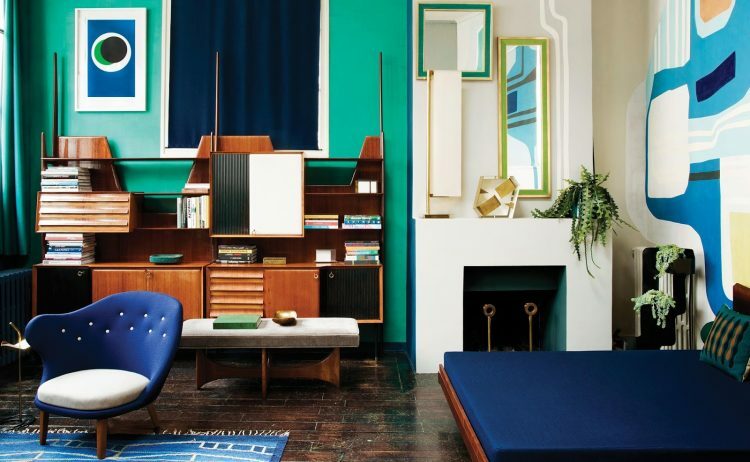 The bedroom strikes with several green walls and an accent one that looks like an oversized piece of art. 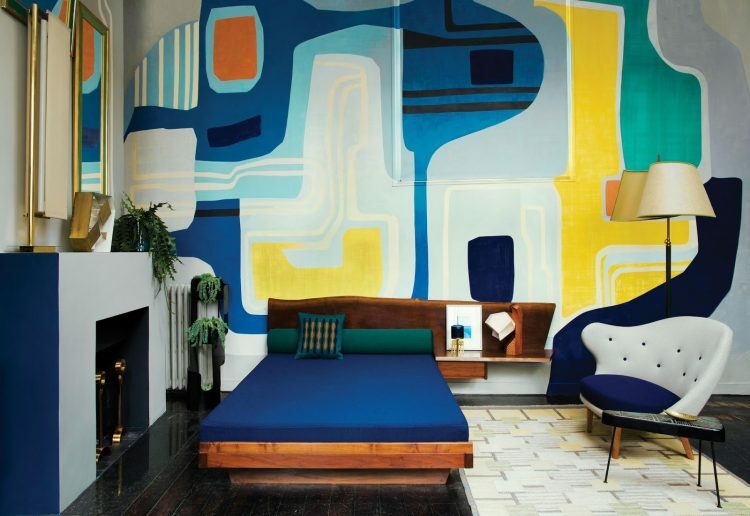 A graphic rug and mid-century modern furniture continue the space décor. The fireplace painted blue and white looks like an image on the wall. 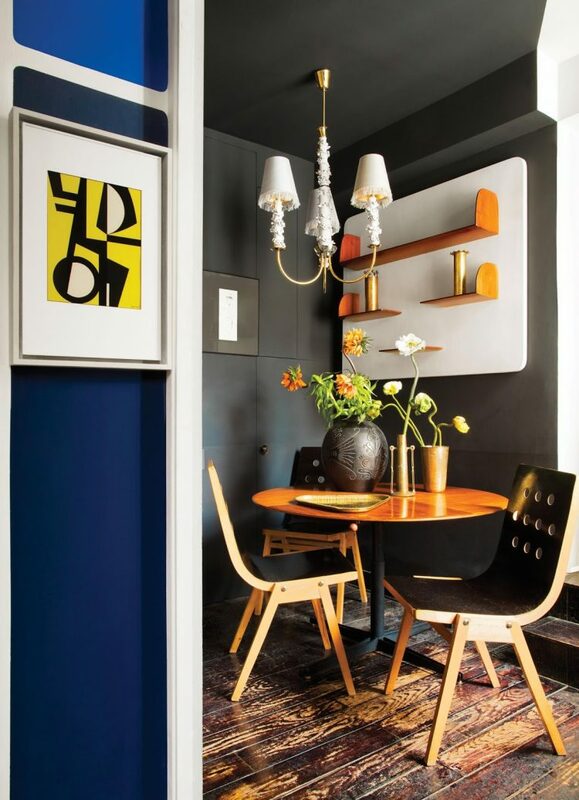 The dining area is graphite black mostly, with several brass and orange touches. I totally love graphic stencils on the walls, various art pieces that add to the décor and big tall windows that let a lot of light in, as with such bold colors much natural light is a necessity. 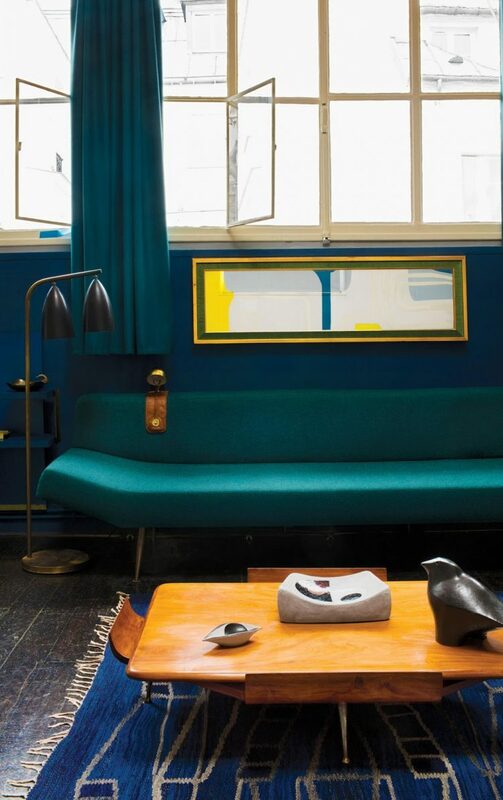 The apartment is filled with art spirit, inspiration and unique designer furniture that you won’t find anywhere else beccause the owner chose it herself and bought from various suppliers. No surprise that she invites her clients to her home, it really stands out and makes everyone’s creative juices flowing!